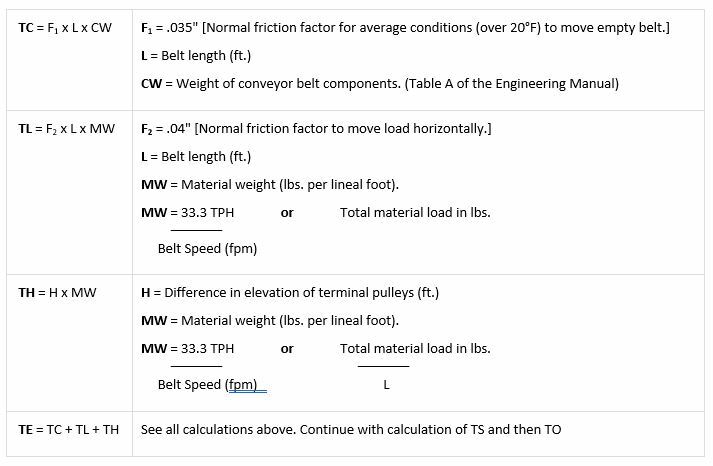 First, the Effective Belt Tension (TE) must be calculated. TE is the sum of the tension required to move the empty belt (TC), the tension required to move the load horizontally (TL), and the tension required to lift the load (TH). Second, additional tension must be added to the effective Belt Tension (Te) to prevent slippage on the drive pulley. This is called Slack Side Tension (Ts), or commonly called T2. To is the total operating tension, or commonly called Allowable Working Tension, and is expressed in PIW (pounds per inch of width). To is sometimes referred to as TL. Additional tension must be added to the Effective Belt Tension to prevent belt slippage on the drive pulley. This is called Slack Side Tension (TS). Total tension herein called Operating Tension (TO), sometimes called Allowable Working Tension, is the value used to select the reinforcement ply combinations. 1. Flexibility to negotiate the pulleys. The minimum recommended pulley diameters for each fabric -- the number of plies combination must be considered at the percent of rated tension of the combination. If this is disregarded, service life will be shortened by ply delamination, splice failure, and tracking problems. (Table C, page 11-5 of the Engineering Manual). 2. Troughability. Eliminate combinations that will not allow normal belt contact with carrying idlers, including transition areas, while belt is empty. A belt with inadequate transverse flexibility will result in poor training and tracking which will cause edge wear, spillage, poor loading, and early belt failure. (Tables D1 and D2 on page 11-6 of the Engineering Manual). 3. Impact Resistance. The final selection must be rated to handle the lump weights and the weight per lineal foot of the material. Loading conditions will vary and must be considered. Your selection must be rated for the condition or the belt will be beaten into premature failure. TTables E1, E2, and E3 page 11-8 of the Engineering Manual). 4. Load Support. The final selection must be capable of resisting the load weight at the juncture of the center support idler and the troughing idlers. The belt carcass will break down and split longitudinally in this area if it is loaded beyond its capacity to support the load. (Table F1 page 11-10 of the Engineering Manual).